Very modern look, which we LOVE! I bought one from an antique store with a propeller base years ago, I ended up selling it and I regretted it ever since - very happy there are good reproductions out there like these - no propeller base but the pedestal looks just as good - love my new saarinen tulip chairs! Recently bought 4 white tulip style side dining chairs with white leatherette cushions. Two chairs arrived first, and the other two arrived the next day. (?). Delivery time was as stated by Inmod. Assembling time was minimal. The cushions are SUPER thin and completely attached to the chair. Beware of food going through the crevices between the cushion and the chair. Good idea to have some kind of brush to clean between them. They come with a rubber cord at the bottom so It won't scratch the floor, but one of them kept falling off so we adhered It to the chair with a strong epoxy sealer, and It worked (at least for now). The bottom screws hidden under the round base keep getting loose and we need to keep tightening them. Maybe we will add a different kind of lock washer. Resuming It all: comfortable, stylish, super strong construction, but a little bit of work for someone who just wants a dining chair. mid-century modern classic design, it fits right in, i never have a complaint when I shop here - fast shipping, really good prices especially for design and quality - love this place, thanks a bunch! Not easy to assemble though once the first one was finally figured out, others went faster. Directions leave a lot to be desired. Chair did not have the black leatherette seat as ordered but a black cloth seat instead. Decided fabric was preferable for us. Otherwise we are very satisfied; chairs are very comfortable. Swivel feature is a bonus for my husband who uses a walker - much easier to get in and out of. Chair looks just as advertised. Its comfortable and easy to put together, however, the plastic gasket (should be rubber) on the bottom does not adhere, is poorly constructed and does not stay in place. Therefore the metal bottom of the base scrapes the floor and requires another solution to this problem. ProsChair is comfortable. Easy to put together. 50's stylish. ConsFaulty cheap plastic gaskets on bottom causing scratches on floor. Black cushions with white seat bring a mod touch to the mix. Pretty much black & white throughout the entirety of my home highlighted with yellows and blues throughout it. OH BOY!! If you are considering ordering these because you are looking for a well-made reproduction of the original Saarinen, these are EXCELLENT especially for price point! I was on a mission to find the best bang for my buck and you won't be disappointed, I wasn't!! gave my dining room a whole new look! I made the decision to purchase these chairs before purchasing a new dining table and they completely restyled the entire look of my dining room, I'm thrilled with my choice! Was looking everywhere for these chairs! They are amazing, exactly what I wanted. I purchased 4 with black seat cushions and another 4 with red seat cushions. Very impressed with the overall price, quality and shopping experience! Love the retro style of these chairs, purchased with the red fabric, the bold white and red contrast is really attractive, happy with the choice! Really great chairs at a really great price. I have nothing but good things to say and get complimented frequently when I have company. ProsComfy cushion. Nicely made chairs. Love my new retro chairs! We have an elliptical Tulip table that these chairs went well with. The chairs are well constructed, pivot easily, and are quite comfortable. They were fairly easy to assemble and after a year we only had one problem. The one chair that is used the most had the top cushion start to loosen. It was fairly easy to disassemble part of the chair and re-tighten theses nuts. I think it would be good if they had nuts with a locking plug to keep this joint with the seat cushion tight. Looking closer at the Saarinen Style Tulip Side Chair, is the base and the seat itself tow different color whites? The base and seat are slightly different whites. The reason is the base is made from painted metal while the seat is molded plastic. 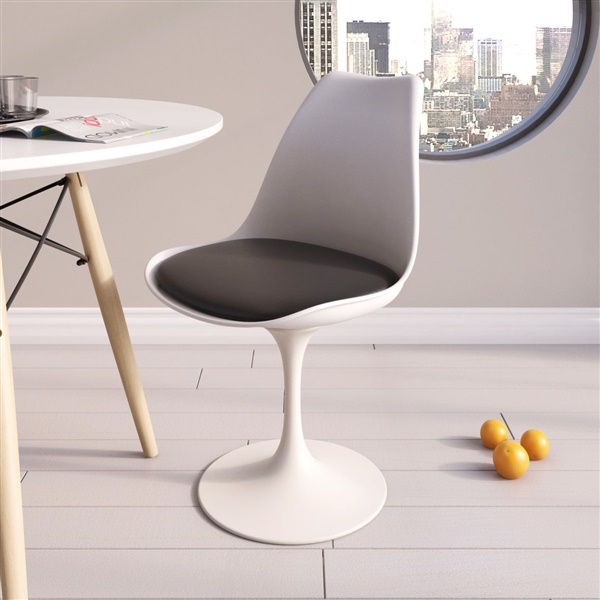 The Saarinen Style Tulip Side Chair is rated for use up to 250 lbs. Yes, this chair does swivel. Is there a non swivel version of the chair? We do not make a tulip side chair that does not swivel at this time. Is it possible to get this chair with a fabric cushion instead of the leatherette cushion? Does it swivel 360 degrees? This does swivel 360 degrees. What is the cushion fabric? How is it cleaned and how is it replaced? What is the max weight limit the chair can support? The cushion on this Saarinen Tulip Style Side Chair is upholstered in a polyester fabric. It is suggested to use warm soap and water for cleaning. If you need to replace it, you would need to purchase a replacement part as the cushion is integrated into the seat. This chair is rated for use up to 250 lbs. The difference between this chair and our other chair - http://www.inmod.com/saarinen-tulip-side-chair.html - is that the other chair is made from fiberglass so it will have much more weight to it. This chair is made from molded plastic.